Ellipical or Oval boardroom tables with Chrome circular metal bases as standard. The tables also feature a 25mm thick wooden tops in a choice of 15 finishes. Comes with a five year factory guarantee as standard. 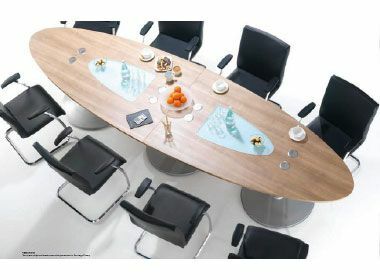 Oval and Elliptical Our range of Tulip boardroom tables have twelve wood finishes to choose from. Boardroom table top shapes are rectangular, oval, double d end and boat shaped. As well as segmented tables which can be used to create modular boardroom table arrangements. There is also a central glass up stand option to add a decorative effect. The steel bases are finished in silver and are extremely durable and hard wearing. Tulip boardroom tables are priced for free delivery only to a ground floor location. Cupboards are delivered assembled. Please contact our sales office for further information on Tulip boardroom tables. These tables are delivered for free to the UK mainland in 10-15 working days from order.